Sierra Concrete Resurfacing installs a wide variety of decorative concrete applications in Granite Bay, California. Whether you are looking to resurface your pool deck, refinish your patio, driveway or other concrete area, Sierra Concrete Resurfacing has numerous products they can install on your commercial or residential surface. Sundek Classic Texture is a very popular acrylic cement coating installed on top of old and new concrete. There are limitless colors, textures and concrete designs that can be installed through using various installation techniques. 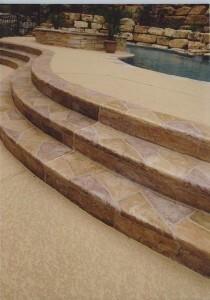 This application is exceptional for pool deck surfaces because of its “cooler than concrete finish”. Concrete Stamping can create the look of natural stone, wood, pavers, flagstone, limestone and other looks but can save you money and time as well. Stamped Concrete overlays can be installed on old concrete as well as new concrete. This is different than traditional stamped concrete that can only be installed on brand new cement. Concrete Staining – Depending on which stained concrete look you are trying to achieve will determine which staining product you may want to choose for your concrete floor. Acid Stained concrete brings out a one of a kind look where as a water-based staining application can help produce more of a controlled stain look, leaving you with a low maintenance beautiful concrete flooring solution. Polyurea Polyaspartic Applications are great for garage floors due to the fact that they are very easy to clean and low maintenance. The chipped flooring overlay is installed on top of your garage floor and can look like terrazzo or even granite. Epoxy Floors – these applications are very similar to polyurea polyaspartic and are very common in garage floors, industrial flooring and commercial locker rooms. The product is very flexible and hides dirt extremely well with the chip floor finish. Whether your looking to repair or resurface your pool deck, patio, driveway, concrete floor, commercial area, Sierra Concrete Resurfacing can offer you a beautiful low maintenance solution that looks amazing and functions well.